Thomas E. Reynolds is Associate Professor of Theology at Emmanuel College. Committed to an interdisciplinary and relational vision of theology, his teaching seeks to deepen Christian engagements with difference and promote compassionate justice. As a father with a son who is on the autism spectrum and has accompanying diagnoses of mental illness, he has become especially interested in opening up the way people of faith think about and welcome people with disabilities into community life. He is the author of Vulnerable Communion: A Theology of Disability and Hospitality. Carolyn Thompson, M.Div. from Episcopal Divinity School, has focused her energies on raising awareness and understanding of disability and access issues in congregations and larger church bodies. She retired last year from the Commission for Persons with Disabilities in Cambridge, MA and helped draft theological statements on disability for the Massachusetts and then the World Council of Churches (WCC), and is part of the Ecumenical Disability Advocates Network (EDAN) of the WCC. She has served on the Disabilities Ministries and the Wider Church Ministries Boards of the United Church of Christ (2003-2009). She has two grown daughters and is a person with a lifelong disability. J. Bennett Guess is Executive Minister for Local Church Ministries of the United Church of Christ and a member of the UCC’s five-person Collegium of Officers. He has worked on the UCC’s national staff for 11 years and was a local church pastor for 12 years in Kentucky while emphasizing God’s wide welcome. Christine Guth is Program Director for Anabaptist Disabilities Network (ADNet), a disability advocacy organization affiliated with Mennonites and related denominations. She is a licensed minister with Mennonite Church USA and is a founder and leader of a thriving support group in Goshen, Indiana, for parents of children on the autism spectrum and a graduate of the Partners in Policymaking Academy of the Indiana Governor’s Council for People with Disabilities. She is grateful for ongoing learning that comes from a personal journey through mental illness and from people she loves who teach her about living with diverse disabilities. Kim Johnson is a clinical neuropsychologist who specializes in understanding and evaluating the relationship between brain disorders and behavior. She works with neuropsychological evaluations and evaluates individuals four years old through senior adult for a wide range of learning problems, Autism Spectrum disorders, ADHD, mood disorders, dementias, brain injuries, strokes and various neurodegenerative disorders. Her Doctorate degree was in Clinical Psychology and she completed two postdoctorate programs: a one-year program in school psychology and a two-year program in pediatric and adult neuropsychology. Bob Molsberry is Conference Minister for the Ohio Conference of the United Church of Christ. A wheelchair-user since a 1997 hit-and-run accident, Bob is the author of two books on adjusting to the culture of disability: Blindsided by Grace: Entering the World of Disability and Tour de Faith: A Cyclist’s Lessons for Living. He is former vice chair for UCC Disabilities Ministries. Bob is an avid athlete and enjoys competing in marathon and triathlon events. Vel Garner is past Director of the Gilliam Youth Services Center and Associate Director of the Division of Youth Corrections in Denver and was responsible for all of Program and Treatment Services for the entire state of Colorado. She is a charter member of the Colorado Black Nurses organization, a founding member of N.U.R.S.E.S. of Colorado, a support group for nurses with substance abuse problems. She has a M.S. in Nursing Administration, and her Doctorate in Public Administration, Policy, Public Management is in progress. She received the University of Colorado Lifetime Achievement in Nursing Award. Kirk Moore is the pastor of Union Congregational United Church of Christ, in Somonauk, IL. He’s a writer, songleader, and guitar teacher, too! 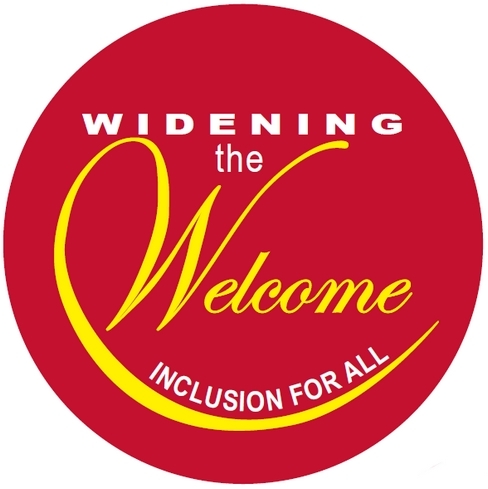 Kirk serves as the web administrator for Widening the Welcome. You can catch up with Kirk on his blog, (kirkogitation.com) on Twitter, (@kirkmoore) and yes, even on Facebook. Kirk, wife Cassie and their three children live in Warrenville, IL. Terri L. Tyson holds a Masters of Divinity from United Theological Seminary and a Masters of Science in Community Counseling from the University of Dayton. She ordained in covenant with the United Church of Christ. She is a licensed Professional Counselor by the State of Ohio and certified by the National Board of Certified Counselors. Jeanne Ann Tyler is a co-pastor with her husband John to the folks of Saint Paul United Church of Christ. John and Jeanne have two adult sons who live in St. Paul, MN. Jeanne is a person with life-long disabilities and an acquired one within the last few years. She has chosen to understand the life-long ones as gifts and burdens. Jeanne’s interests are in theology, pastoral care and opera. Peter E. Bauer is a United Church of Christ Minister. He also serves as a Licensed Clinical Social Worker and Licensed Marriage and Family Therapist working for the South Texas Veterans Health Care System San Antonio, TX. Peter also serves as a Lieutenant Colonel, Medical Service Corps, Army Reserve. Kelli Parrish Lucas, M.Div., has discerned that the issue of accessibility and our churches is part of her call to ministry. Kelli lives with all of the both/ands of having being born with disability, and acquiring disabilities, as well as a passion for exploring all the topics of disability ministries with others. Kelli completed research into the ecumenical responses to disability in addition to studying disability ministry/theology in seminary. Kelli has served as a chaplain in mental health facilities and is currently serving as a per diem hospice chaplain in San Diego County, CA. Barbara T. Baylor is the Minister for Health Care Justice, Justice and Witness Ministries (JWM) of the UCC. She assists the UCC in all its settings to encourage an understanding of health and health care as issues of social and economic justice and is committed to quality, accessible and affordable health care for all. She has experience working in public health with many diverse groups, including the faith community, to provide leadership, empowerment and capacity building programs that focus on health care justice,community wellness, health promotion, disease prevention and the reduction of health disparities. CJ Siroky is trained as a Biochemist and worked several years helping to develop psychiatric medications. She became a consumer herself in 2001 after being diagnosed with Major Depressive Disorder and Dissociative Identity Disorder. In 2006, she became the leader of the Mental Health Awareness team at First Congregational United Church of Christ in Indianapolis, IN. Marie Siroky is a graduate from Christian Theological Seminary in Indianapolis, IN. She served as Pastoral Associate to First Congregational United Church of Christ in Indianapolis, IN, has served in many Chaplaincy roles and has been an advocate for those mental illness and brain diorders. She became familiar with stigmas in her work with those with HIV/AIDS starting in the mid-90’s. CJ and Marie Siroky have been together over 20 years. Craig Rennebohm is a UCC pastor who has worked for the last 23 years on the streets with individuals who are homeless and struggling with serious mental illness, substance abuse issues and PTSD. He is the author of Souls in the Hands of a Tender God, and will be leading a series of three workshops on creating caring congregations. Lynda Bigler, pastor, Congregational UCC, Humboldt, IA, had a career banking and became a full-time, stay-at-home mother. She served as Girl Scout leader and cookie sales committees; Cub Scout den leader; Boy Scout troop treasurer; alumni National Chair and Director of the Brown University Alumni Schools Committees, and the Disability Services Advisory Council of Multnomah County (Oregon). Visually impaired since birth, Lynda takes particular interest in accessibility in educational settings. Ken Gilbert, M.D., has supported village based health systems in eleven countries, served as medical director for a large state psychiatric hospital, and organized village development and AIDS education in Cote D'Ivoire. He has been a prison psychiatrist and now works with a large mental health provider for persons who are seriously and chronically ill and offers treatment for substance abuse. In Nov 2009 he suffered a massive brain bleed. Since then he has returned to employment as a psychiatrist. Brett Webb-Mitchell, Presbyterian pastor, an advocate with people with disabilities, has written curricula relating to people with disabilities in faith communities, and was writer/consultant for the PCUSA's statement on inclusive congregations, "Living into the Body of Christ: Toward Full Inclusion of People with Disabilities." His latest book is Beyond Accessibility. He has served eight congregations; taught at Duke Divinity School; is Visiting Associate Professor at NC Central University; and is Director of the religious non-profit, School of the Pilgrim. L. Scott Lissner, American with Disability Act Coordinator, and the ADA Coordinator & 504 Compliance Officer for the Ohio State University. He is an associate of the John Glenn School of Public Policy and is a lecturer for the Moritz College of Law, the Knowlton School of Architecture and Disability Studies. He serves on the Ohio Governor’s Council on People with Disabilities, ADA-OHIO, the Columbus Advisory Committee on Disability Issues and as President Elect for the Association of Higher Education and Disability. Peggy Wolfe Dunn serves as the current chair of the UCC Disabilities Ministries Board. She is ordained in the UCC, is pastor of the Union Congregational Church UCC of South Bristol Maine and the Director of the Maine Conference Academy for Congregational Life and Leadership. She has a passion about inclusion, resourcing and encouraging congregations to become Accessible to All (A2A). She has been affected by mental illness, substance abuse and acquired brain injury in her extended family. Alan Johnson is the current chair of the UCC Mental Illness Network, the chair of his church’s Mental Health Ministry, and a founder of the Interfaith Network on Mental Illness (Boulder, CO). He worked in the national setting of the UCC from 1979-1995. He has been affected by mental illness, substance abuse, and suicide in his family and has recovered from a stroke.